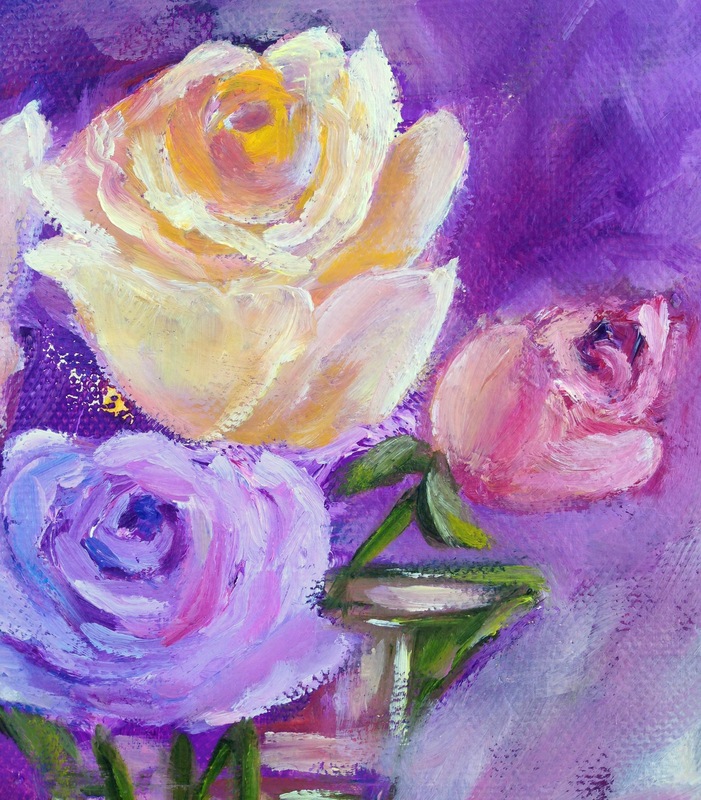 I did 2 paintings and am almost done with a third painting, all part of the new rose collection I have started as part of my feminine essence series. I also supported my first art coaching client, before I was ready to publish a new page on my website. 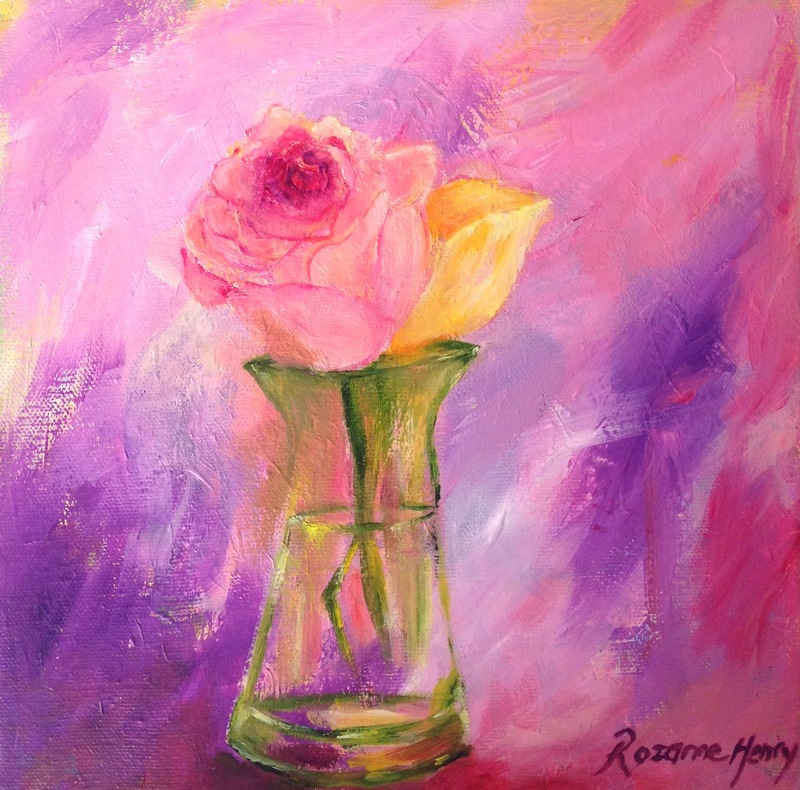 It actually feels like intuitive art coaching actually but I will share more another time. I am also working on a wonderful project right now that will help you very much creatively too. Here is the birthing stage of this painting. It was so interesting. It felt like a “coming forward” from a place of darkness being left behind. I really love how this looks. The colours changed at this stage. 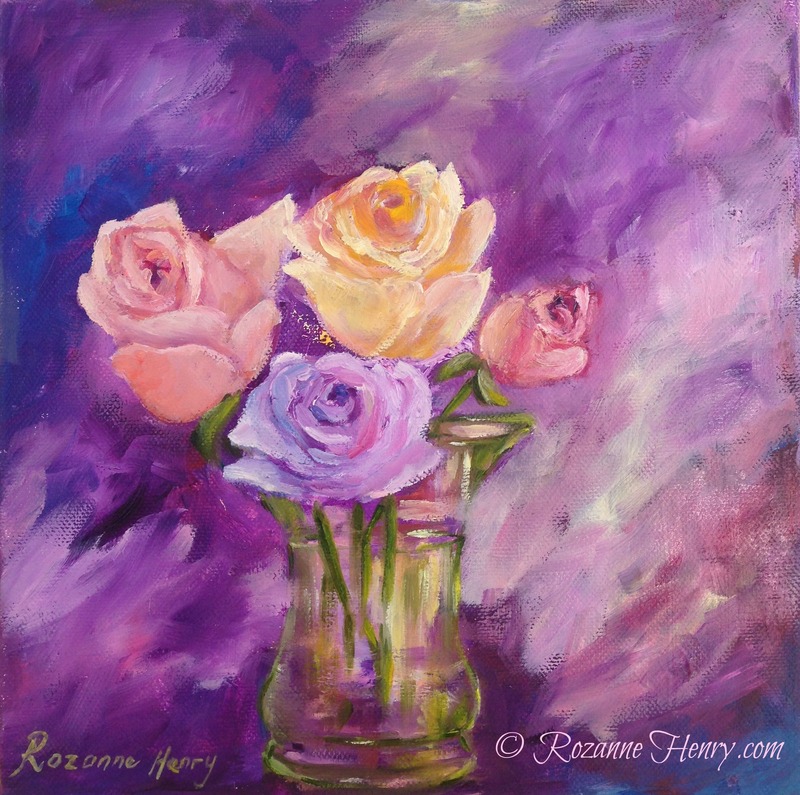 I really enjoyed the lilacs and purples blending into soft blue and pinks. 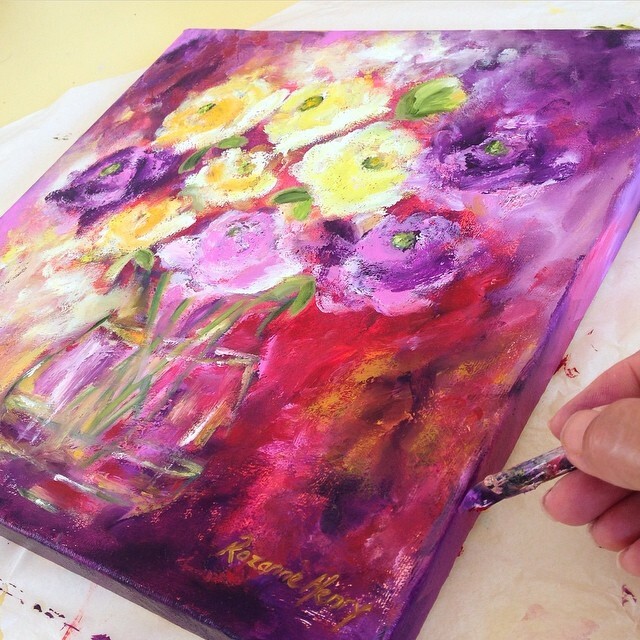 Some days a painting feels quiet and more detailed…. This is exactly how this felt as I painted it. It was one of those days when there was no music in my studio, not even the calming tunes I sometimes play. 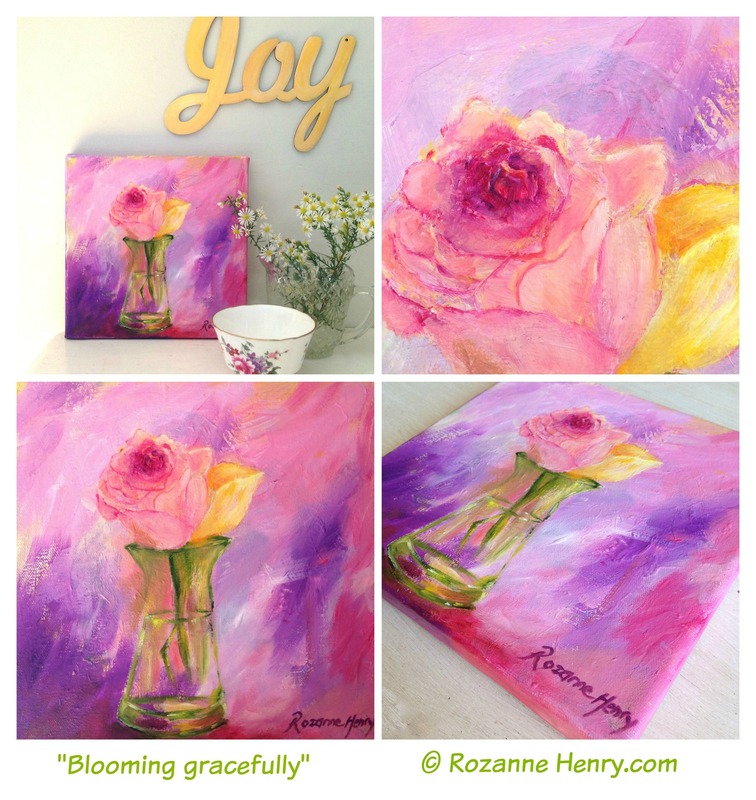 I preferred a quiet atmosphere and a peaceful kind of joy began surrounding this creation…. 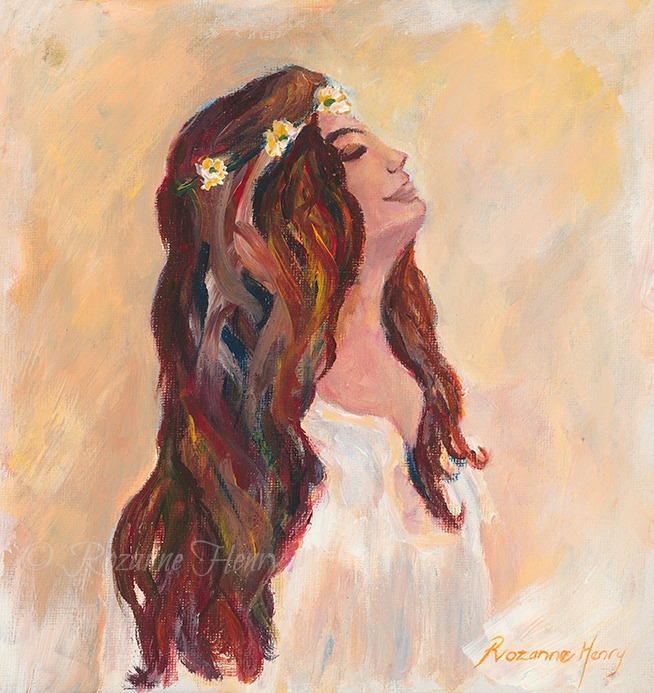 I decided to call it “Blooming gently” because it was created with a quiet serenity, reminding me that the unfolding of a woman’s beauty can be vibrant and other times it can happen quietly and softly… but always her beauty waits to be unfurled. 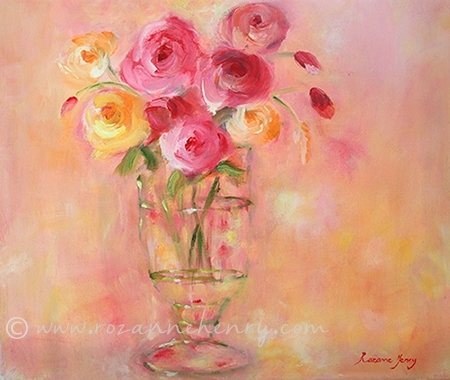 These rose paintings would make a beautiful Mothers Day or self love gift to yourself. 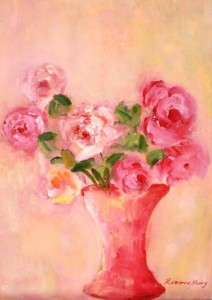 This painting has been created in oils and can be hung immediately. It does not require framing. 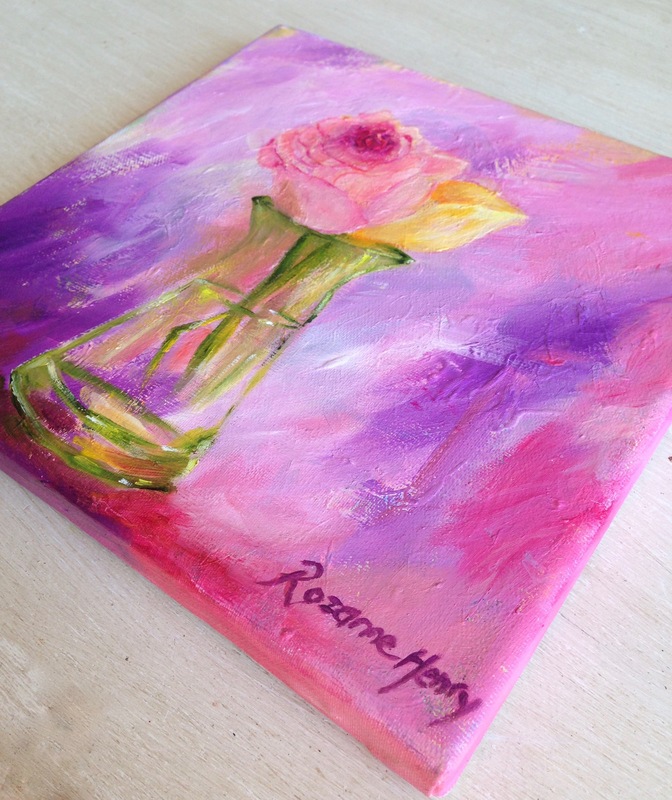 It is 25 x 25 (10 x 10 inches) in size with a narrow edge of 1,5mm. It is also part of a painting project I am busy with, called 100 expressions of love and is painting no. 43. A personal desire to live with a different energy in my life was the inspiration behind this project. You can follow updates daily on Instagram. PS: If you are interested in doing heart-centred art coaching sessions with me….I will have details available very soon. 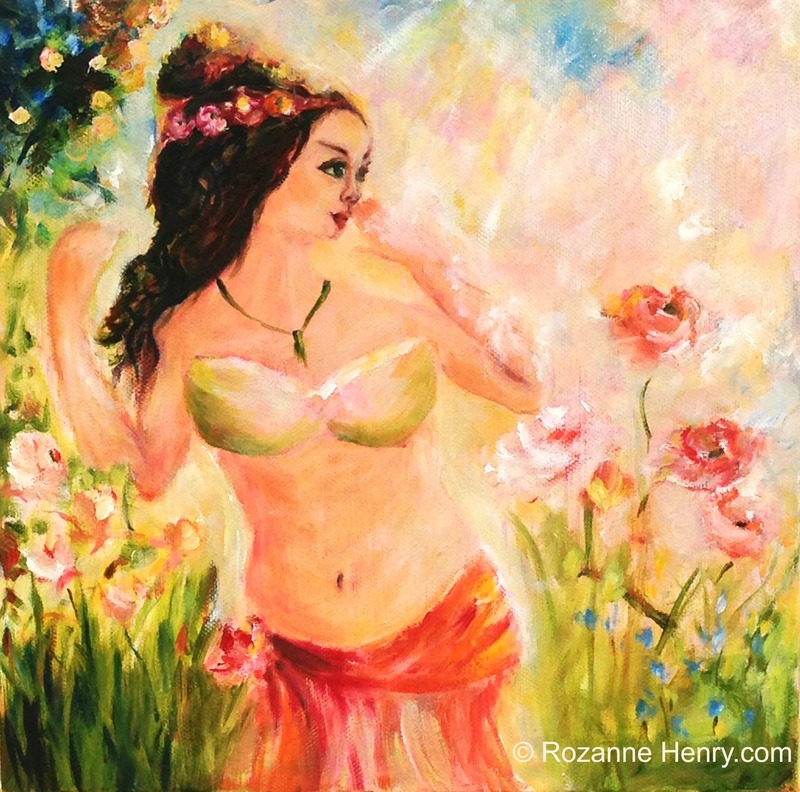 Recently I received an email from a coach who helps women reclaim their feminine essence. 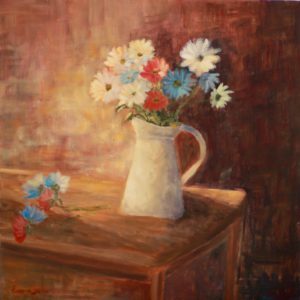 She saw my paintings on Instagram and asked if I license my artwork as she would like to use my images for her blog and webinar. I decided to offer opportunities for others too. 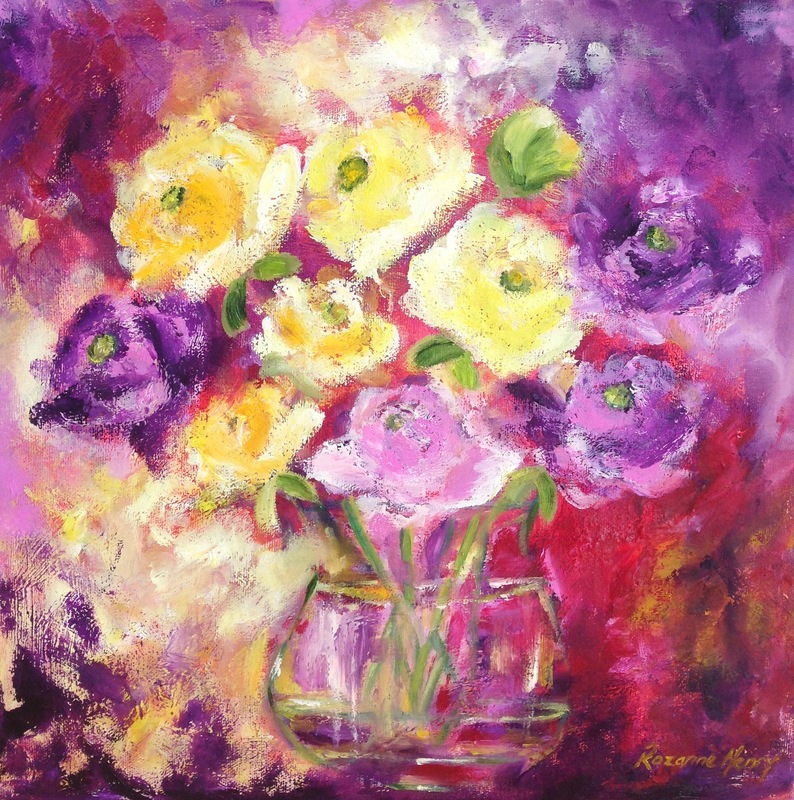 So, if you are a soulful woman, with a heart-centred business, my paintings may resonate with your beautiful message you are sharing with your own tribe. I would love to collaborate with you. ….all the elements that bring our feminine essence to life…. 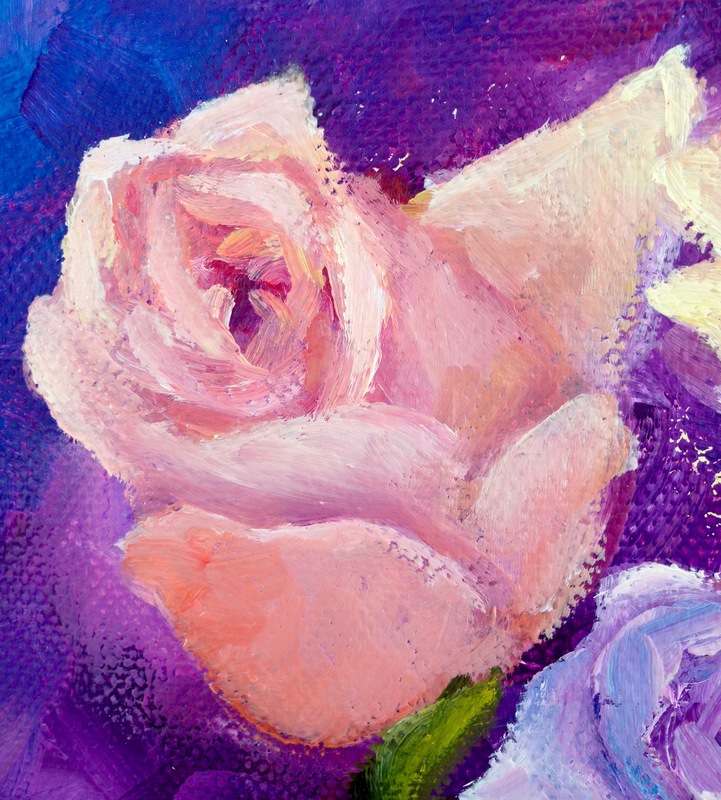 I am also beginning to add a collection of roses to my feminine images because this flower is so symbolic of our feminine essence. 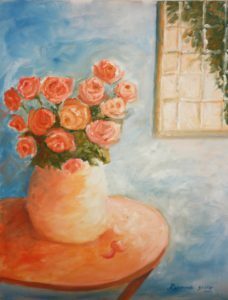 These paintings can enhance your blog posts or webinar, If you are interested, you may email me and I will help you further. Or head over to the “Contact Me” section on my homepage. I created this painting on the night of the Full Moon earlier this month. The light of the moon spilling over me and my easel till 11 pm that night. 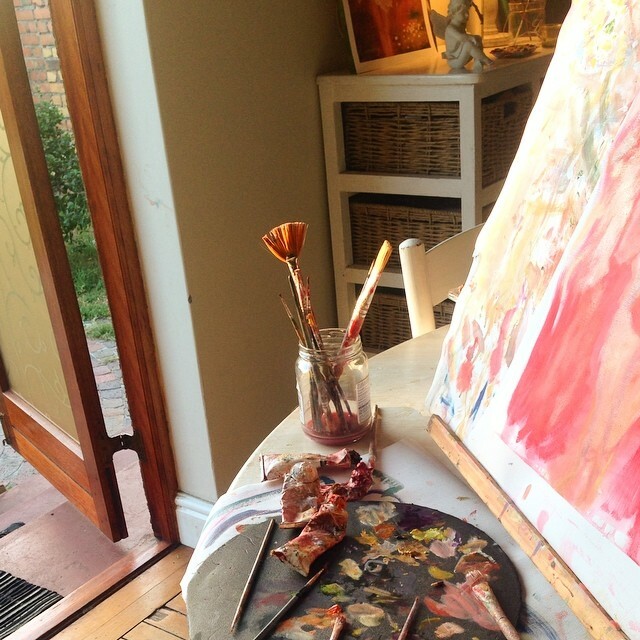 It was a really warm evening as I painted at my kitchen table, with the doors wide open. I felt so alive and happy painting her. Here is a photo of the joyful scene that greeted me in my kitchen the next morning. “Taking a stand” … To feel beautiful. To feel alive as a woman. Taking a stand to no longer play it small and hide in order to be more accepted. Taking a stand to no longer diminish joy so that someone else can feel better about themselves. Taking a stand to radiate our personal dreams, to honour our calling, our purpose so that we can feel even more alive. Taking a stand against shame in all it’s faces. Taking a stand for JOY instead. Wherever shame lives inside of one, in whatever way, a woman becomes a tiny small diminished awkward version of herself. Taking a stand to finally draw a thick, solid boundary between the words of someone else and our own truth. 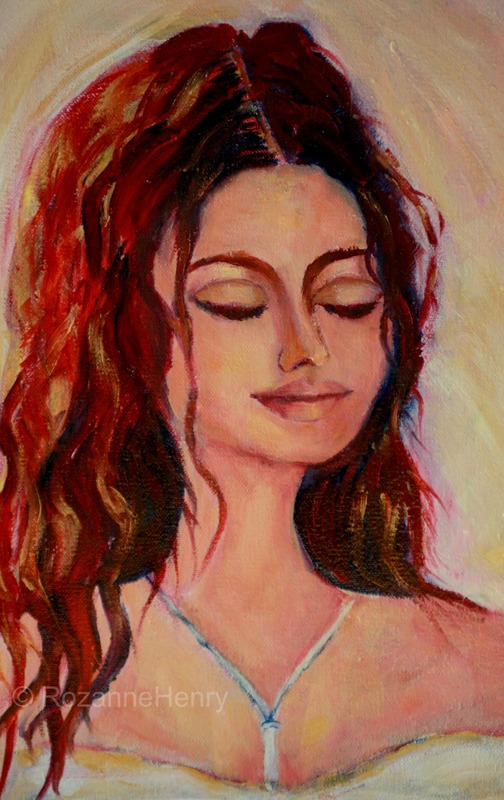 To take a stand and say: “That is not what I am choosing to believe about myself.” That is not my truth.” I am choosing to feel worthy …to feel beautiful …. because that is my inherent goodness. To embrace a joyful alive way of living because that is what has always been Divinely intended for me. Not this. Not this business of hiding and playing it small. Not this business of feeling unworthy. And even if one is still transitioning between the 2 worlds …and the door to the new is not quite open yet…what matters is that a stand has been taken. 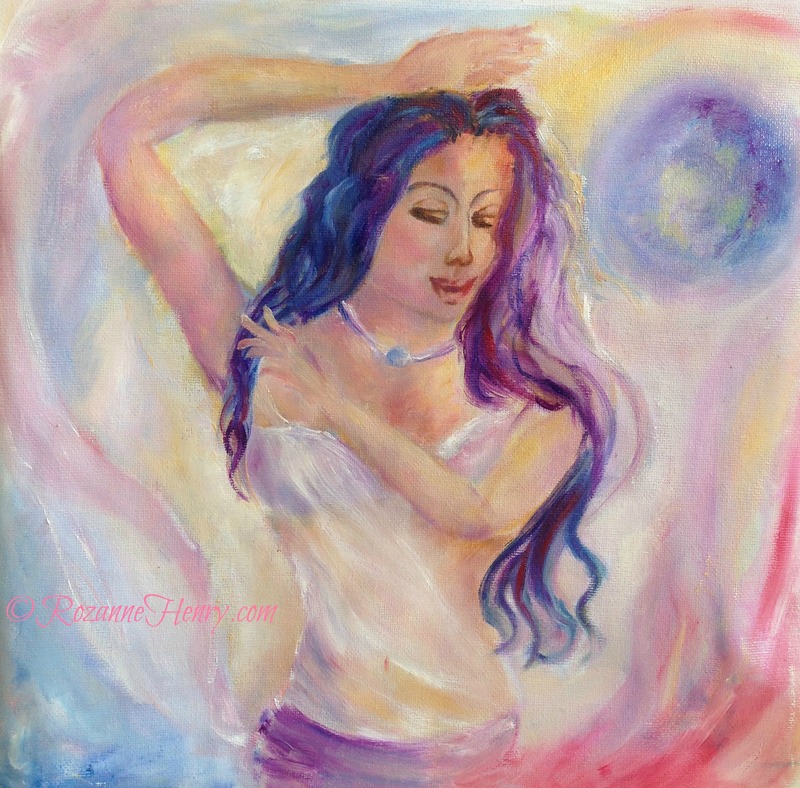 She expresses a woman in her personal power, ready to begin living a life that is aligned with truth. With joy. With freedom. May joy free your Feminine spirit. May you and I allow this for ourself. 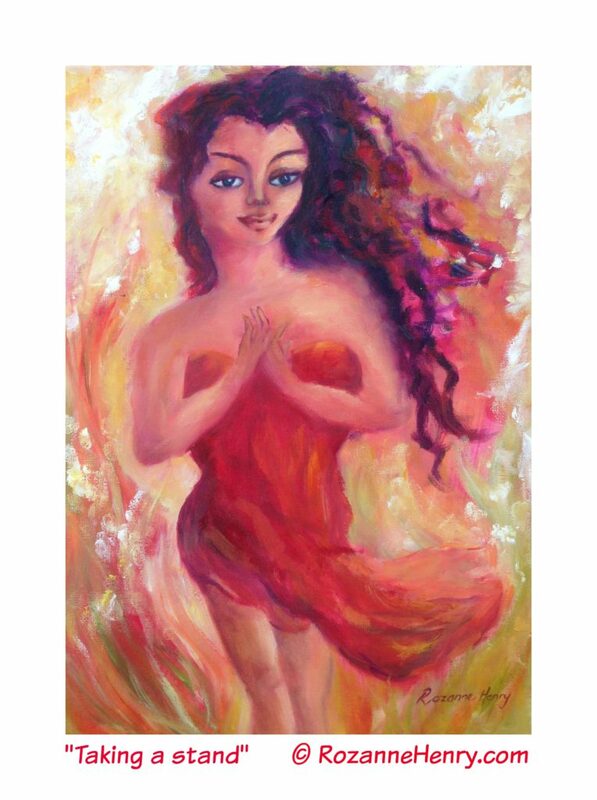 She has just arrived in my Etsy shop and is available for you as an original oil painting or as a cover to a blank journal. She is no. 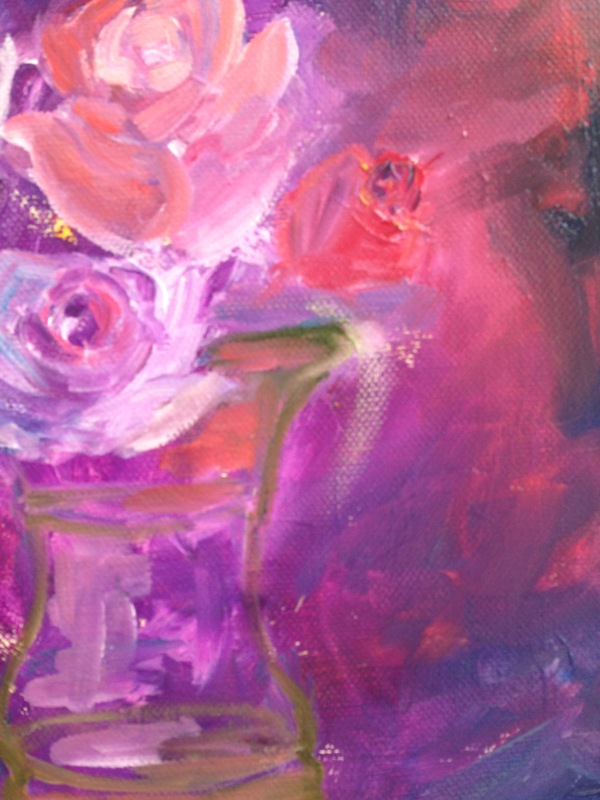 40/100 #expressionsoflove… a painting project I began to draw a new energy into my own life. May joy free your Feminine spirit. May you and I allow this for ourself. 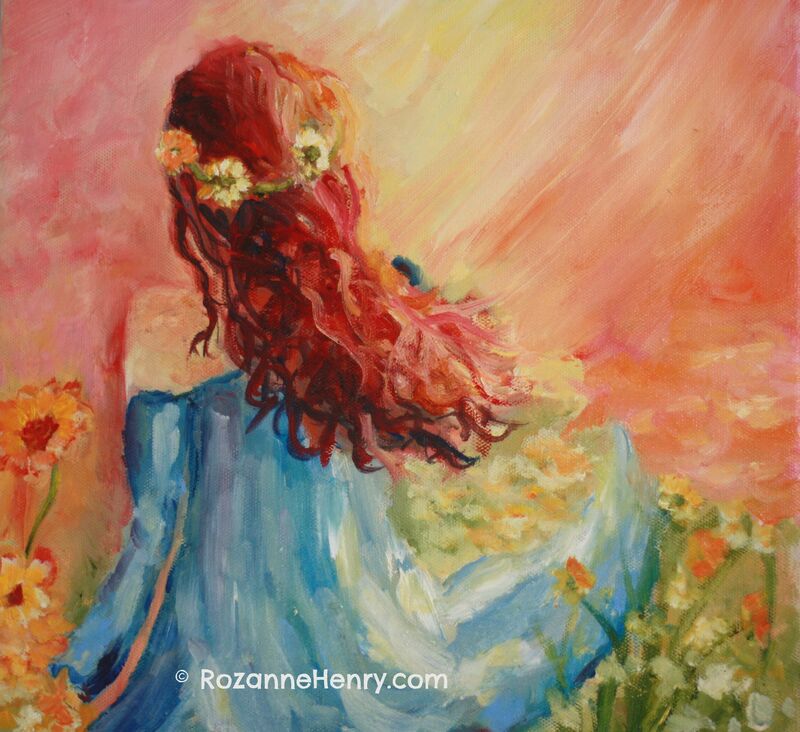 Motherhood awakened many many of my creative and intuitive essence.. For me this was really where my painting journey was ignited after the seeds were sown in my teens. My love for nature was felt deeply as a young child and a personal love affair for gardening was birthed during my time as a stay at home mom. 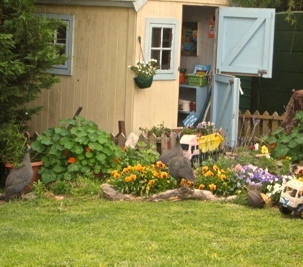 I had a most beautiful garden, abundant and lush with colour and birdlife. Oozing with charm and character, little woodland pathways I created with stepping stones just like out of a fairy book. I easily and lovingly tended my haven for hours and hours as my sons played happily around me. 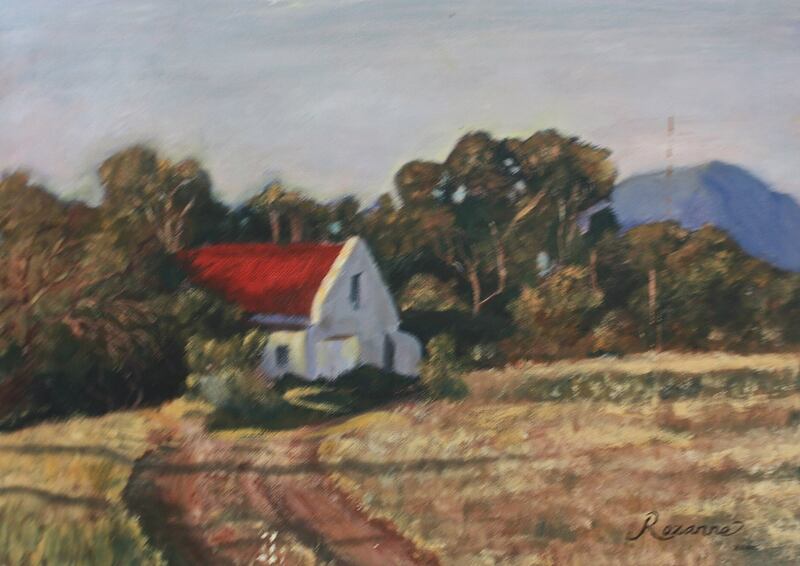 It was the place I would take my easel out onto and paint in the shade. It was the place where endless mother-child picnics and story time happened on our lawn. It was the place I photographed my sons at play…. over and over and over again. 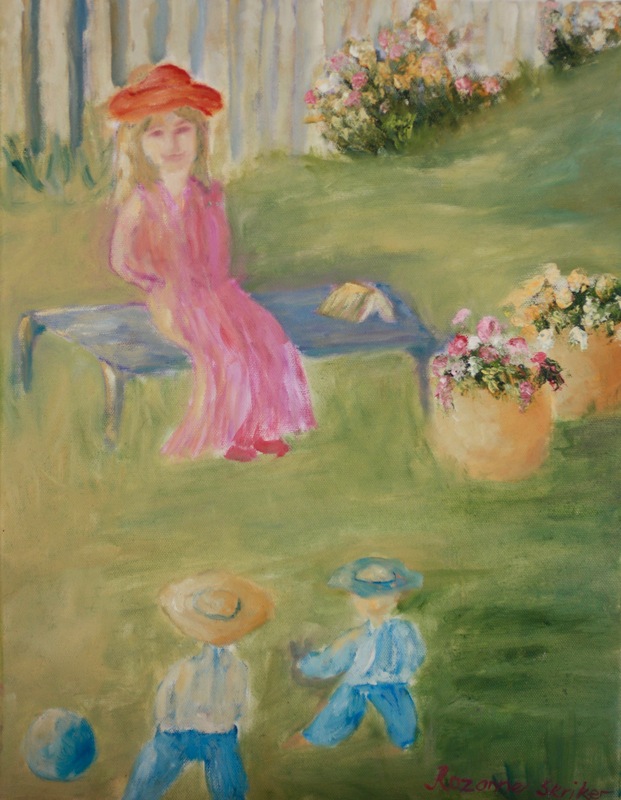 And I tried to paint ourselves in the garden, from memory, because I was never in the photo itself, always the one behind the camera. 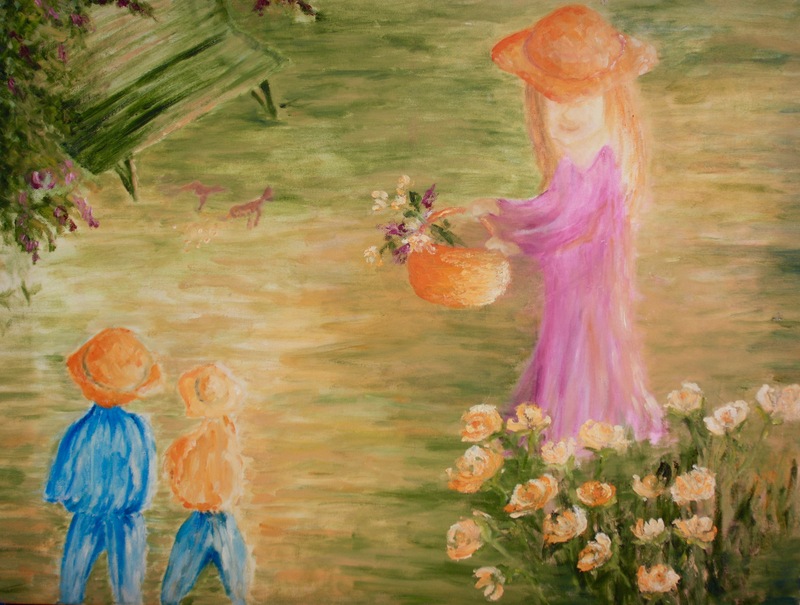 Below are paintings I did while raising my sons, I am sharing these paintings with you…. they are so humble with many “imperfections” because I have never had any training on drawing and painting the human figure. But you know I am bravely showing them to you today because my heart and my passion for my sons and how we lived our days is sooooooo much more important to me than a perfect painting. Passion inside of me drives what I put onto my canvas. How deeply I FEEL about something. 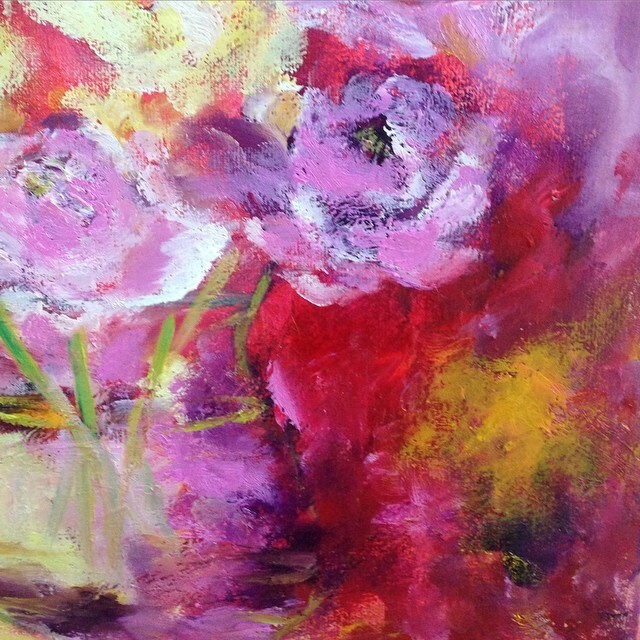 My love for my garden, my flowers, my sons are so real for me in these paintings. 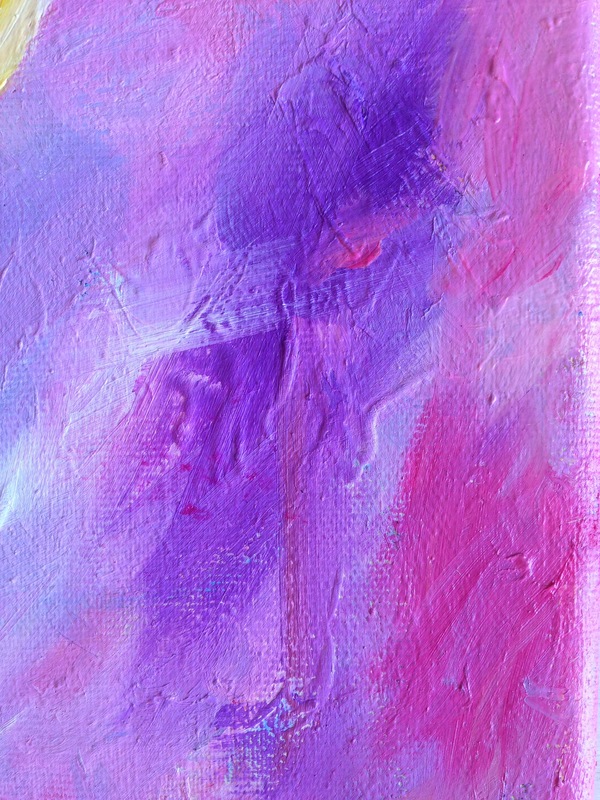 My desire to express a sense of connection still influences the way I paint today. 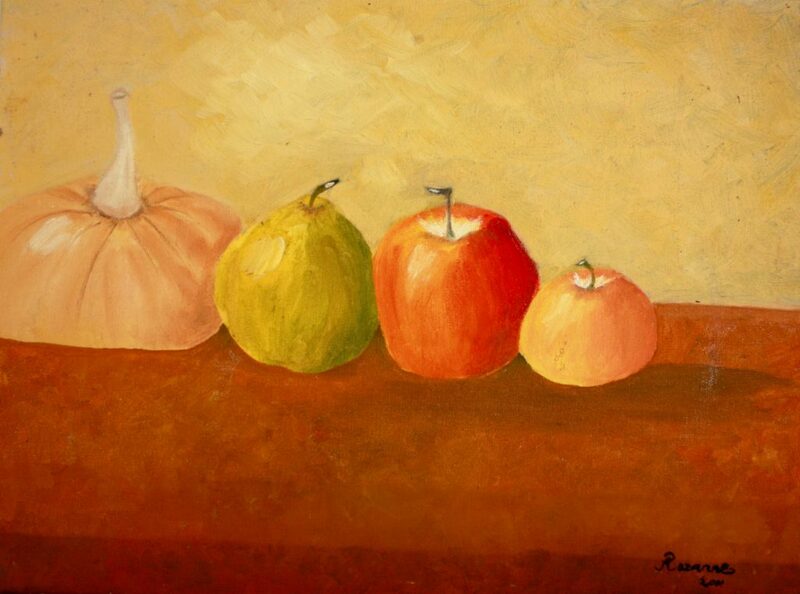 ….And this last painting is incomplete. 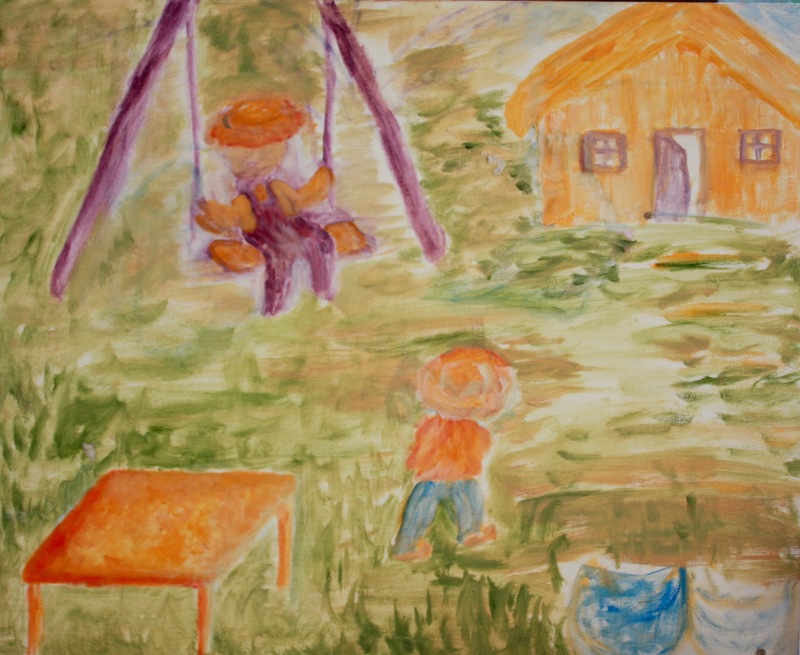 I painted this one day as my boys were 4 and 6 years old, watching Winnie the Pooh. 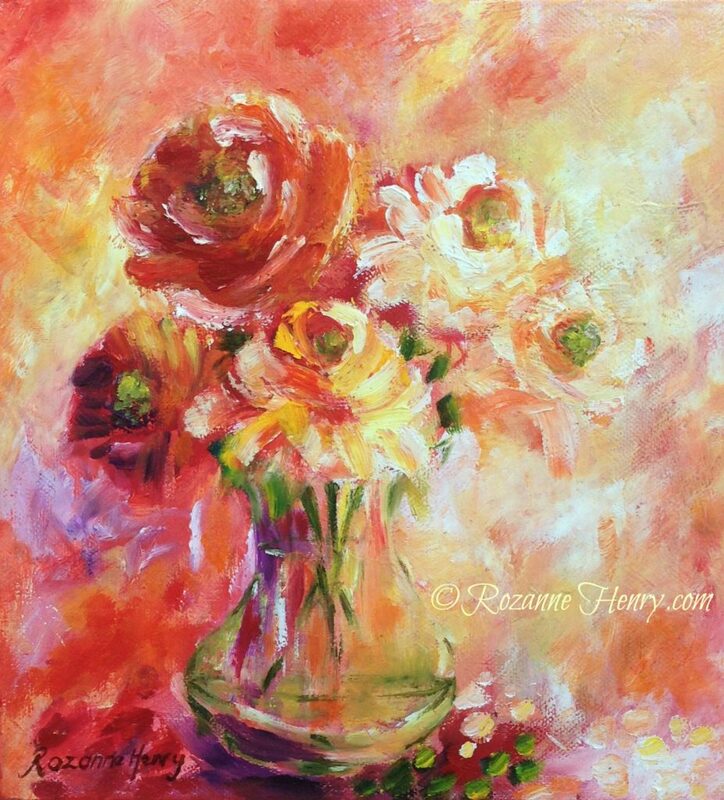 The music was so happy and so cheerful and I sat down and painted this scene. 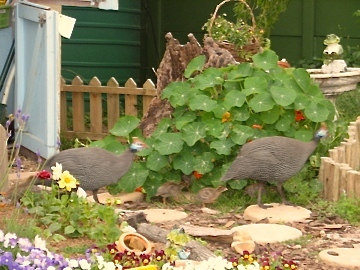 A very typical scene of my boys at play in the garden. And of course, these are blue flower pots I was going to paint. Again, a very humble painting but filled with so much of my love. 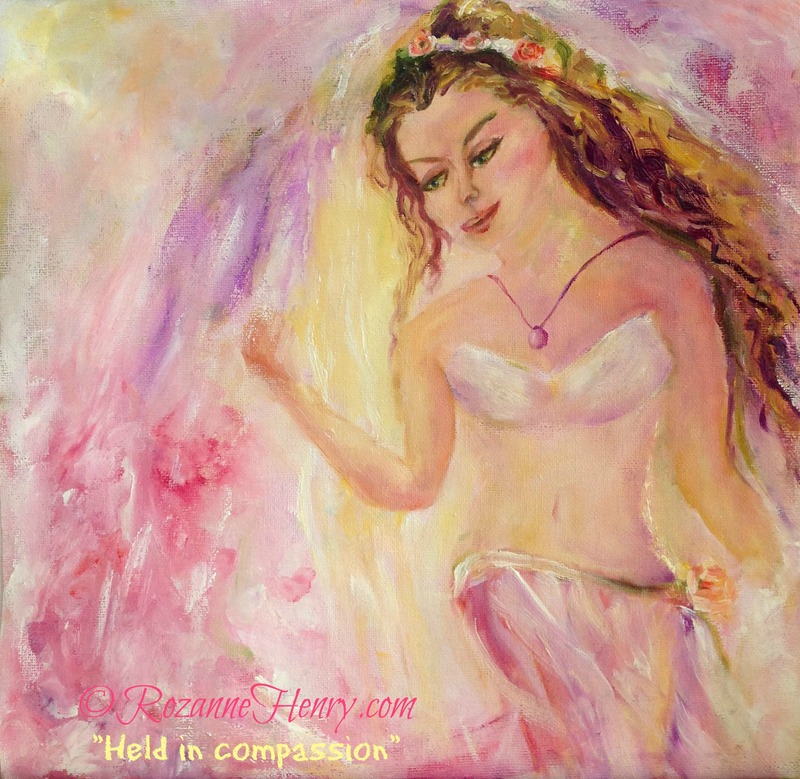 I have to share that a very very strong feeling grew in me to continue to paint the mother child connection and use the images in an inspirational way for mothers to calm themselves and just breathe a bit easier. I allowed my fear of drawing the human figure to get in the way and this dream.. this inner feeling that felt like a Divine nudge… I never allowed to be properly birthed as it could have been. 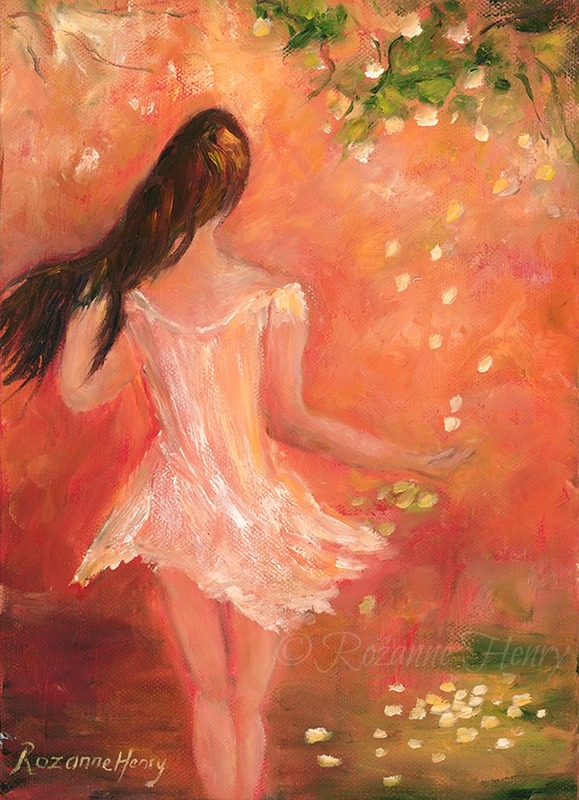 This was one of my favourite paintings I did one really hot summers’ day. I tried to paint a woman sitting at the table but struggled so much with it that I painted the hanging branch over her. Life changed when my older son started grade 1. Suddenly I lost something huge. He was no longer as interested in the awe and wonder of nature as school-based left brain activities has a way of leaving a child with much less enthusiasm for this natural state of being. 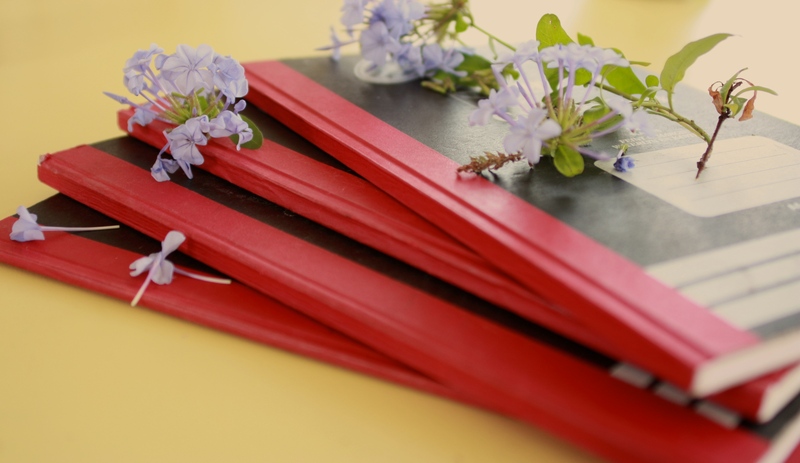 It was under my trees that I began writing in these books daily….. weaving my way through my feelings and also recording my days as a mother, wanting to capture the memories and connection to my sons forever and one day hand them a book to read about all of this. I hope I get to actually do this. Through my writing I came to see something I had never realized before. I came to see how much my children fed my creativity. They totally did. And this is why I felt incredibly lost when they began formal schooling and no longer had the desire to create and be in nature with me as easily and spontaneously as before. It was time to begin birthing myself as a woman. Motherhood very much awakened not only my creativity but also my intuition too as I was given an “inner vision” of my first son right after I fell pregnant with him but was not yet aware of the life inside of me yet. …those images were symbolic of the many ways we as women can ripen into something beautiful… despite how we may have felt about ourselves. It is not just our wombs that ripen with life. We are more than our role as a mother, we have the ability to give life to personal dreams and even our calling. A woman is always ripe with possibility, don’t you think? 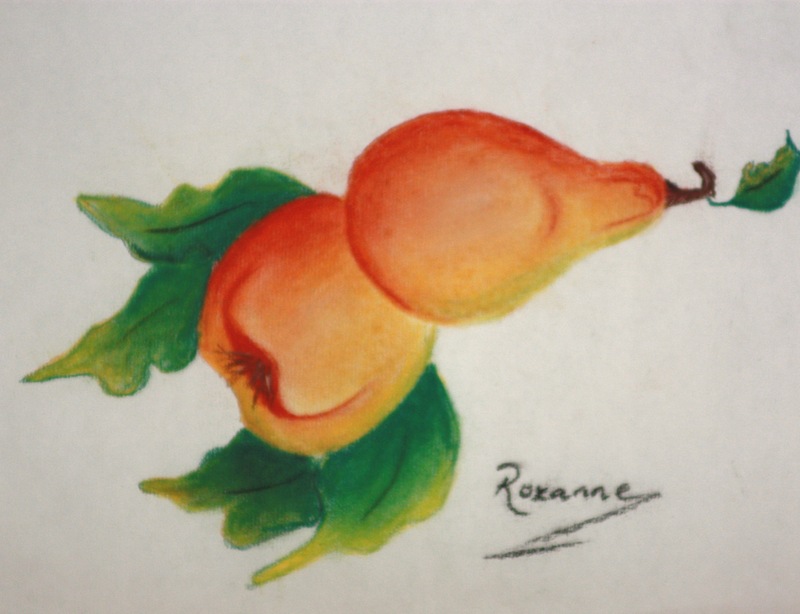 I am also noticing the warm coloured fruits that I was drawn to way back then. 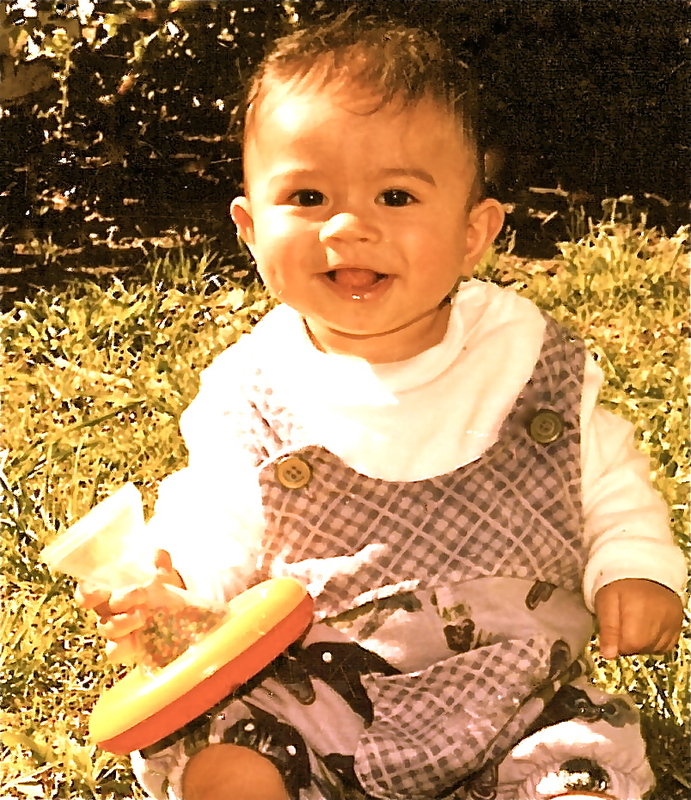 Then two years later, my second son, Joshua was born. The one who is key to my art and spiritual journey as it is today. My son and I walked a journey together of colic and post natal depression. What a nasty combination that was…. 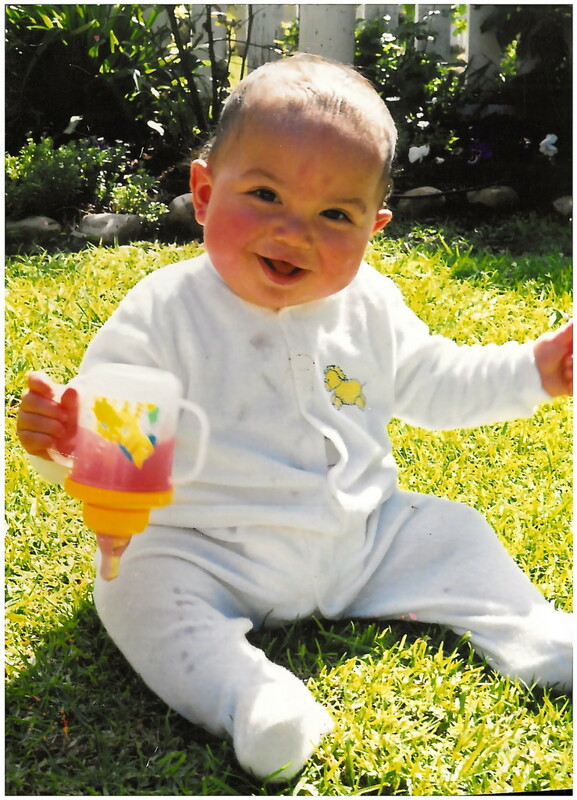 but what a gift this child of mine handed me under the disguise of his colicky days…. I stumbled into my first meditation class with Natalia Baker and this class changed everything for me. I began a daily meditation practice on my own. A softness began growing in me. My depression lifted and my heart began opening towards my precious child. And…. my love for painting was re-awakened. I tell you, what a beautiful healing journey this was for me. Meditation remains one of my regular spiritual practices to this day, as I never forgot how transforming it was for me. I will always be grateful for that time in my life that felt like I would never feel different. This was a painting I did while my “colicky” baby lay quietly at my side, for about 3 hrs…I kept thinking to myself: “I am feeling so happy. 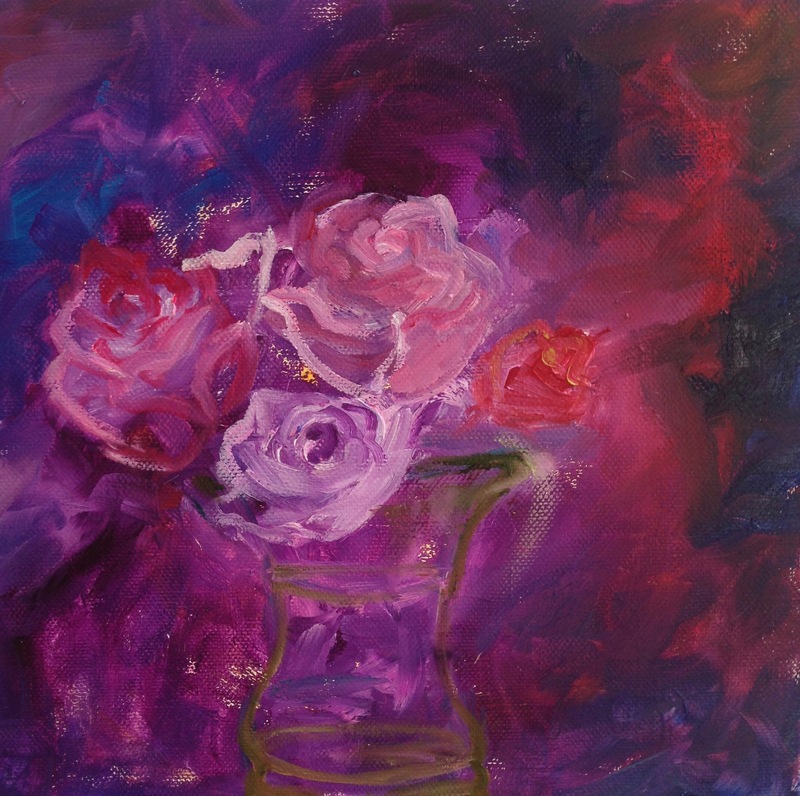 Why don’t I paint more?” It was as if my child was giving me permission to find myself again. He “knew” exactly what soul lessons he was handing his mamma…. and would continue to hand her 15 yrs later. 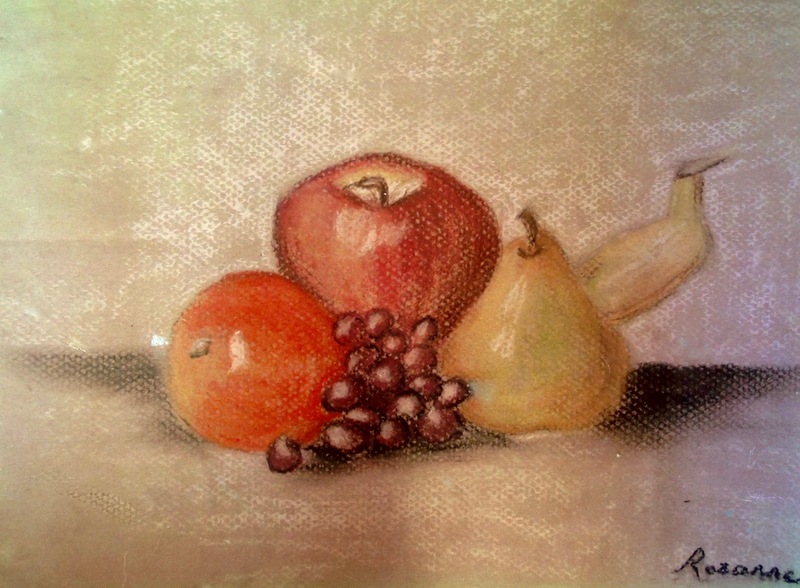 This was another pastel painting I did during this time. Then one night, around 3 or 4am I was trying to calm my baby as he cried from the colic cramps. At one point, we both became really quiet. My eyes began closing in exhaustion and suddenly I saw an image with my “inner vision”. It was an image of my baby’s room becoming my art studio. It was followed by a clear message which I heard. The next day, that was exactly what I did. I moved him into his brother’s room and this…. 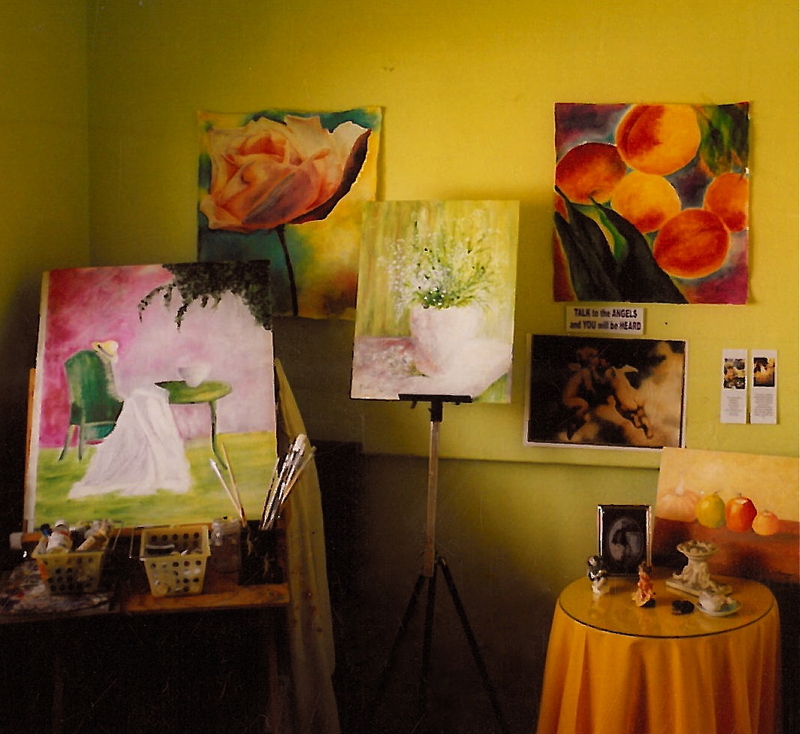 ….. became my first painting studio. I believe we are Guided in those still quiet moments when we are our most receptive to the message from Spirit. I created a meditation corner too, a little chair sat next to the table, covered in orange fabric. My intuitive connection grew a lot from this experience. 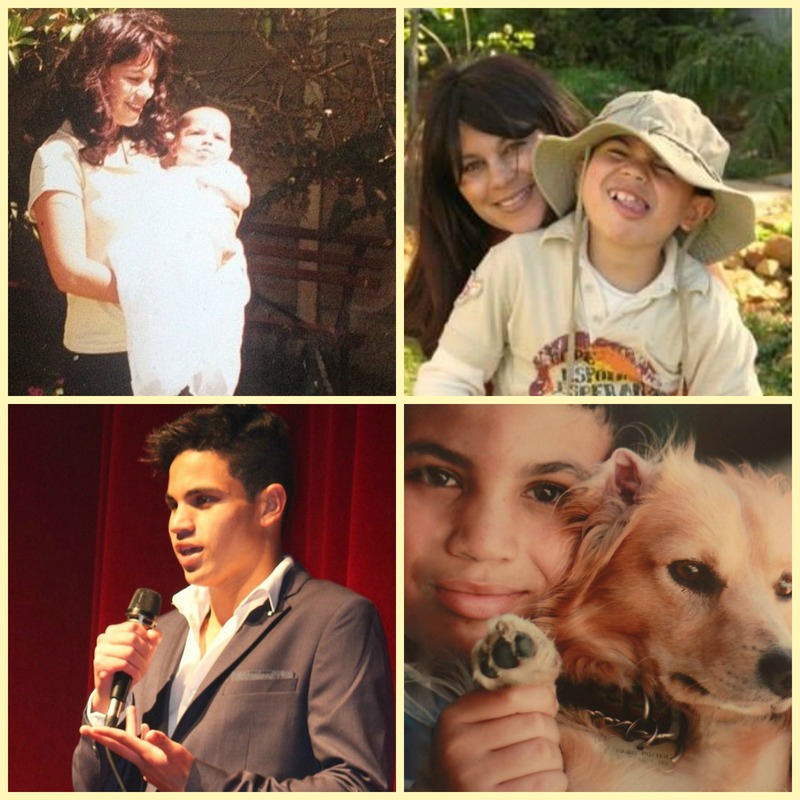 My son Josh, as he prefers to be called, would continue to challenge my path as Artist and Intuitive into my forties. 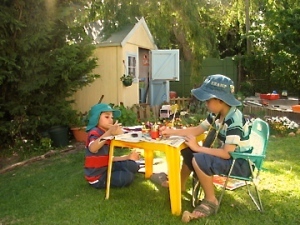 When my boys were 2 and 4 yrs old, I began landscape painting classes as a way to get out of the house and do something for myself. Just for me. What huge personal lessons I learnt during this time. All the students were given a chance to exhibit their work and I noticed something very alarming. I actually could not feel proud of my work at all. It looked just like all the other students’ work and all our work was a replica of the teacher’s paintings. I never forget how awfully disappointing that felt to me. I knew my painting was technically “good” but my own voice was nowhere to be found in them at all. People would admire them but I would ignore their comment as they did not truly feel like my own work. We were told exactly which shade of green to mix and I would spend weeks completing one painting, copying from a picture, making sure all the details were there. After the exhibition, inside of my heart I felt that it needed more soul. I could not really describe what i actually even meant. I just knew something was missing. I knew then that I would never feel proud of my art if it had only technical skill. It was then that I made a promise to myself that I would work hard at developing my own style… because my own style for me meant, my own voice. You see, my whole life had been lived in the shadow of someone else’s voice. I had never felt free to be me. And actually in essence I am a free spirit as we probably all are without all the “shoulds”. So painting in a way that resembled someone else’s style and voice was just not ok for me. At all. I felt I was walking in their shadow and not shining as ME. I was just being another version of them. In fact I fought so hard against this, that the day came when I stopped going to any more traditional painting classes. Period. That was it. Something had snapped in me. Even though it meant having to become a lot more motivated to paint all on my own. I have to say that painting is a most powerful way to claim ones voice as your own. I have to say that when we paint from a deep guided part inside of us, then finding ones own style and ones own voice is no longer something that feels like hard work. It just flows. I believe that we all walk different paths that is right for us. This is just how I have personally experienced art for myself. Very soon afterwards I was Divinely led to doing 2 things: The first was that I began a Aura Soma Course which is a form of energy healing, using colour to bring to light that which is happening within one on an unconscious level. It was very new to me but I was incredibly drawn to it and loved it very very much. The second part was being Divinely led to an Intuitive, Visionary artist Fiona Almeleh. The circumstances under which I was led to her was very much not of this earthly nature. For the first time I began experiencing what it was like to paint from the heart, not from my head. 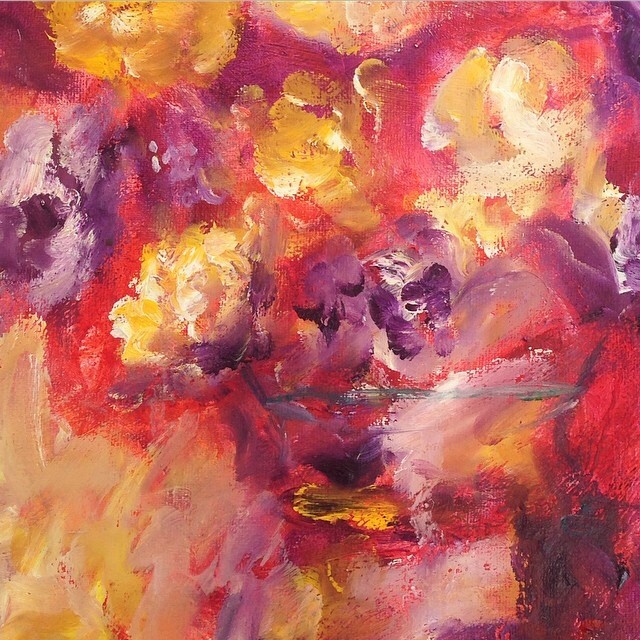 To work intuitively with colour, which I still do today. Fiona now lives in the UK. 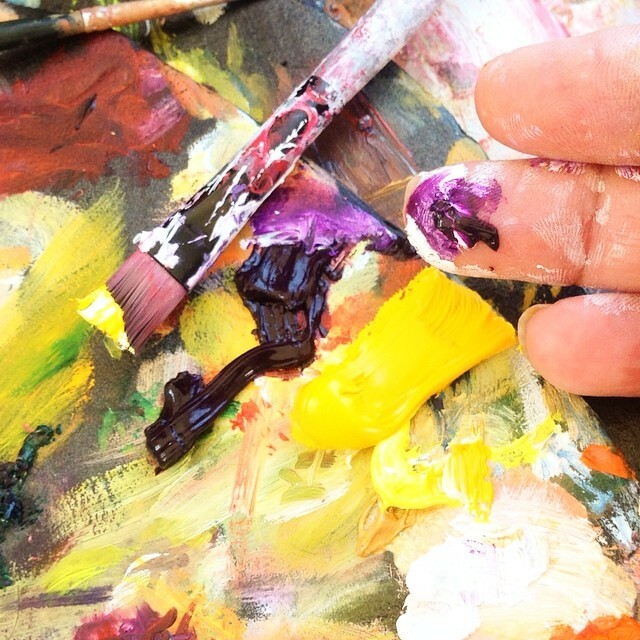 She had such an impact on my path that even after I stopped painting with her, I was able to bravely begin a painting with no image in front of me and if I had an image, I would allow it to become mine…. to bring emotion and energy into my painting more than anything else. 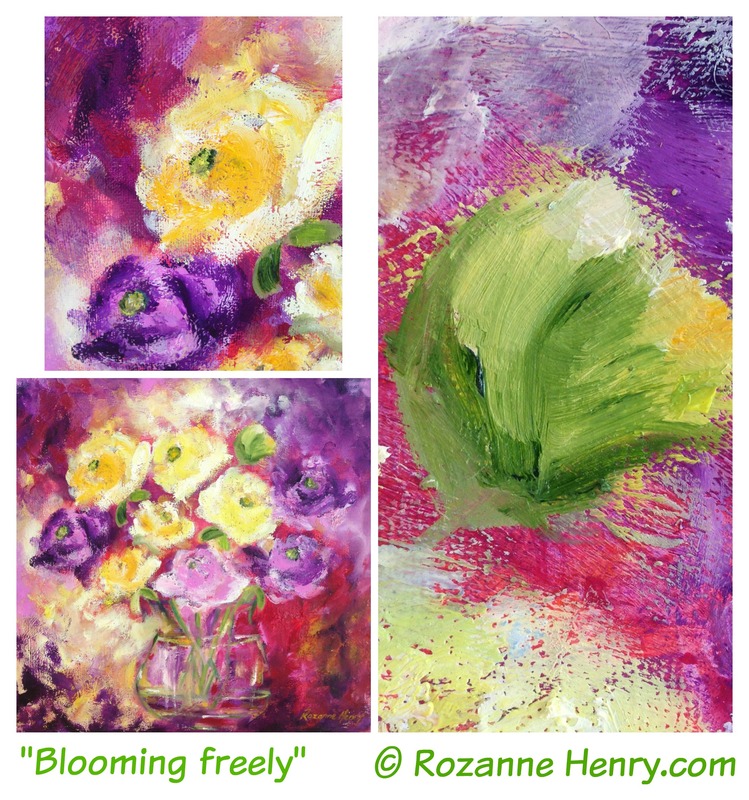 Even though my paintings do not always look obviously intuitive, behind each image is a very heart-centred intuitive process, some of which I gathered from Fiona and others that I began learning on my own. 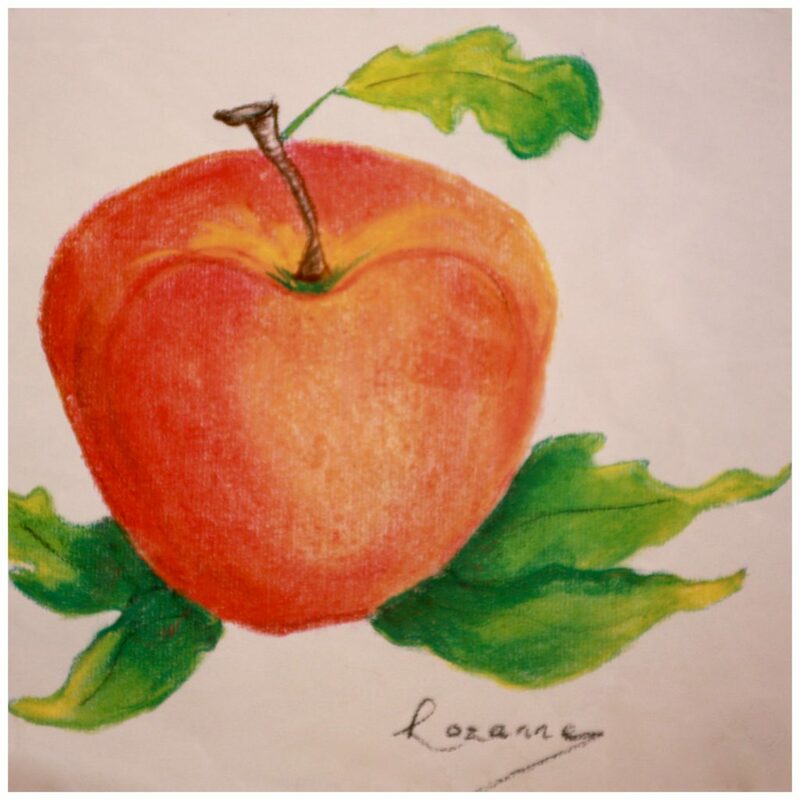 Here are some more paintings i did in my thirties. 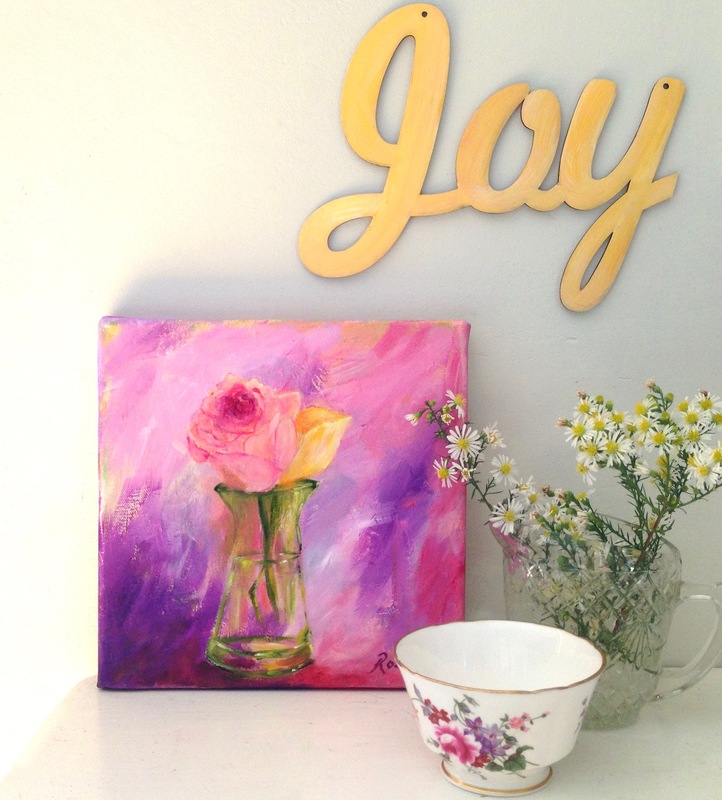 grew a passion for my painting, discovered the wonder of photography, captured my feelings and motherhood through writing and began reclaiming my own voice through art. I am mostly grateful that I am able to honour the sacred gifts disguised within challenges. I am grateful that I have gone beyond the icky feeling of showing art that is still evolving as I have done here. My younger self would never have done this. The truth is our art is an ever evolving process. Our beginnings and how it all unfolds are all important. My purpose is to share and allow myself to be seen in all my human- ness. I deeply love art as a vehicle to all forms of freedom. 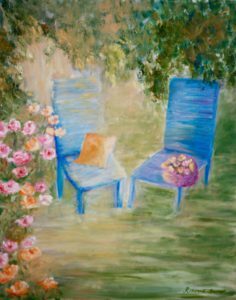 Thank you for reading my painting journey. May parts of it sing to your own journey and shed some light for you too. PS: There are new paintings and prints that are available from my shop. 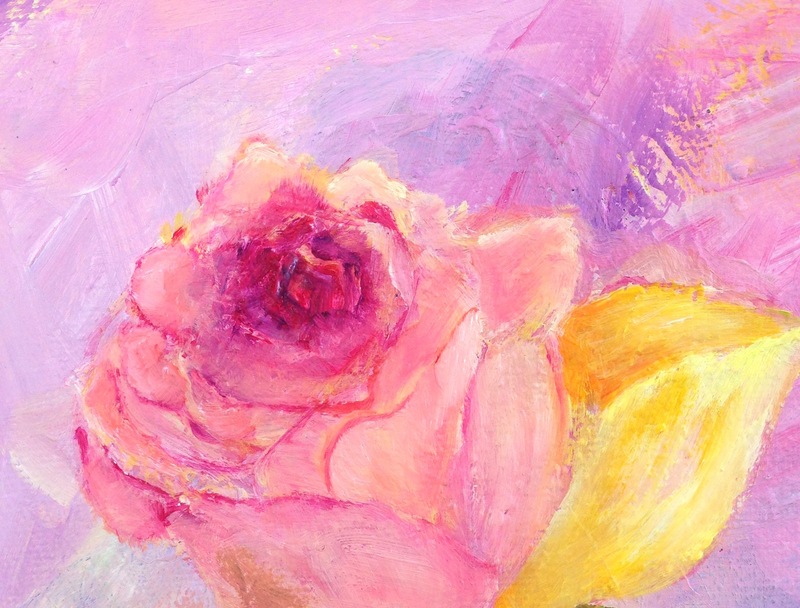 About a week ago I began feeling called to add the beauty of roses as a companion to my Feminine images because they are such a mirror to how soft and delicate yet vibrant we can be. How we can burst forth and bloom in springtime after a season of cutting back what no longer is healthy…after looking like nothing lovely can possibly happen after being cut back to little bare, stick like things in the soil …how the tiny bud can hold so much potential as it unfolds…. 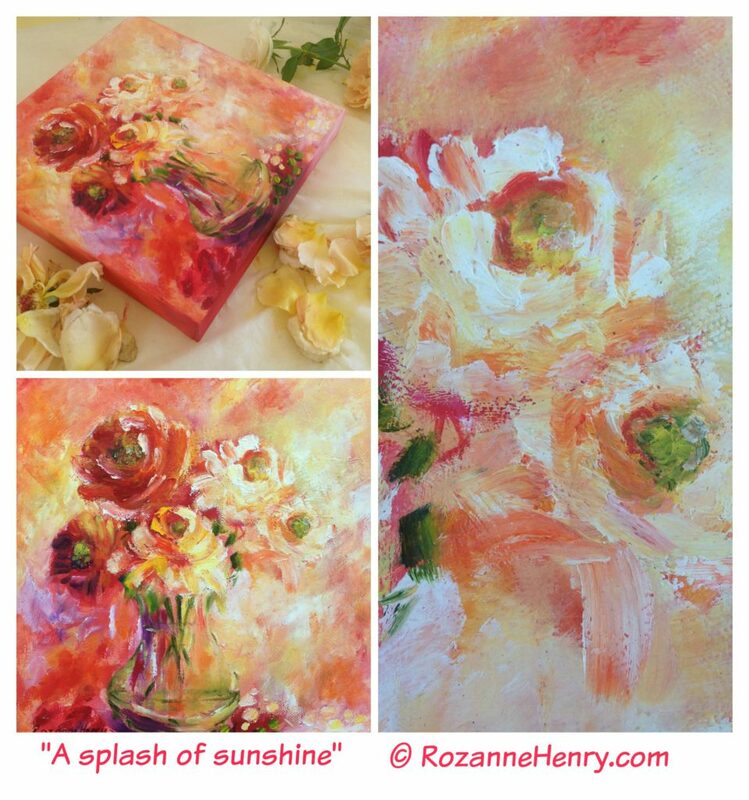 “A splash of sunshine” is a reminder for you of this. She has already been SOLD. I shared her on social media yesterday and she will be finding a home in the USA. 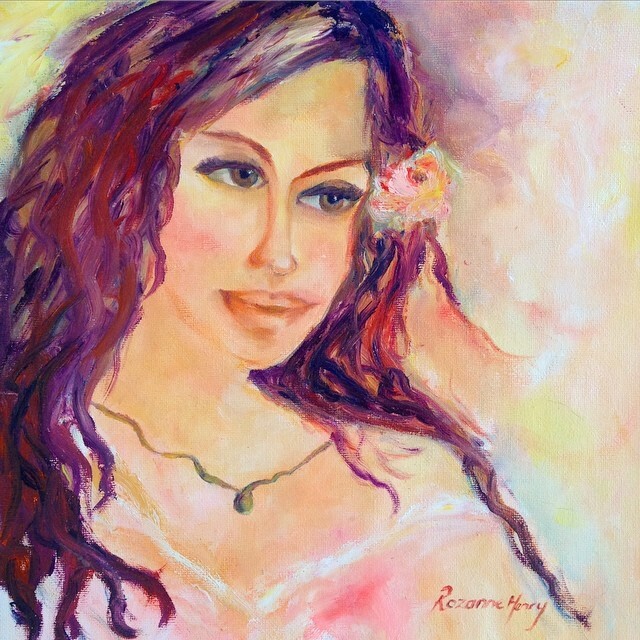 What i truly love is when my artwork speaks to another woman who lives her life choosing to “walk in beauty” which is exactly how this lovely lady lives her life and expresses what she does in the world. This is no. 41/100 #expressionsoflove . A painting project I am currently doing. 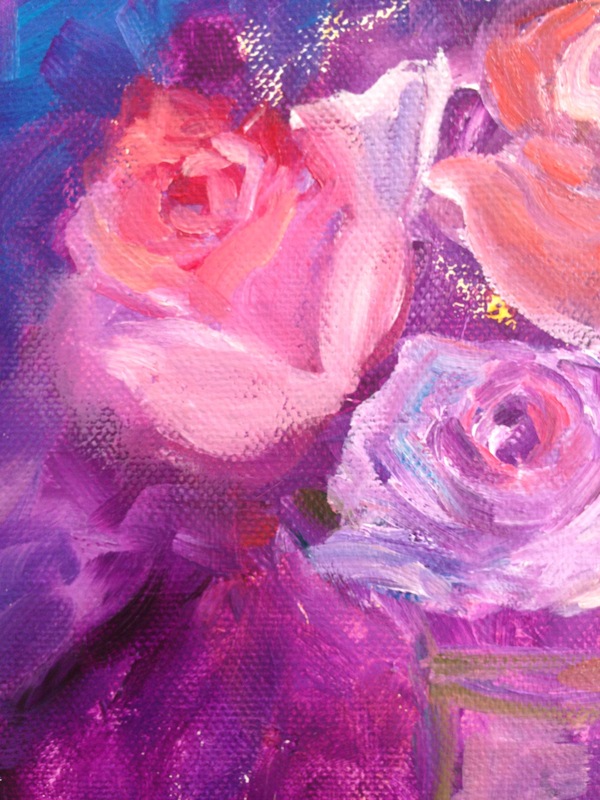 Here are some close up images of this painting. I really love the combination of softness and vibrance here. 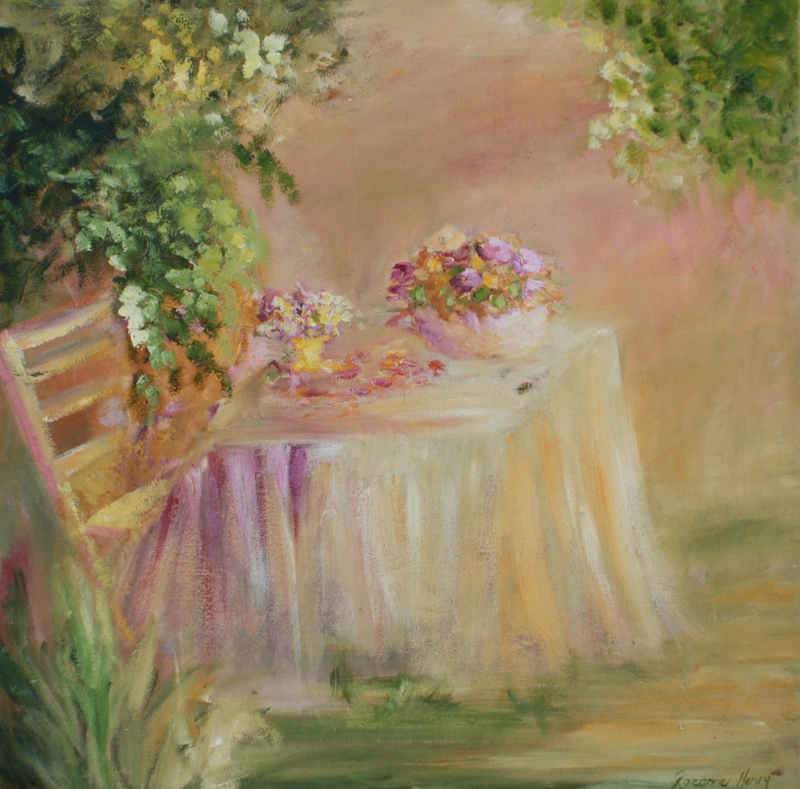 This painting was originally created in oils and painted very intuitively. You can also request for me to have a blank page journal created for you with this image as the cover.